Laura Elizabeth Woodbury, heir to a Montana cattle ranch, has just lost her father. A year ago, he bestowed upon her the nickname, “princess Sapphire” when he discovered sapphires in a mine where, sixteen years earlier, he’d found gold. 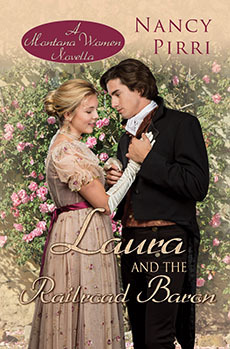 The independent Laura is astonished to learn her father has hired a fancily-dressed stranger to assist her in finding a suitable husband, and to help run the ranch. Matt Black is the right hand man of a Minnesota railroad baron who’d been a friend of Laura’s father. Matt’s been hired to head up a team of railroad workers replacing damaged railroad tacks across Montana and to find a decent man to marry Laura. Matt is completely unprepared for the headstrong, willful blond and soon finds himself in love with her. Laura feels the same way about Matt—until she learns his secret that will change her life completely. “Nineteen-year-old women do not have guardians,” Laura Elizabeth Woodbury huffed. No wonder the ranch hands referred to her as ‘Princess Sapphire’, thought Matt Black, stretched out in the side chair across from her. If it hadn’t been for the curve of her breasts, she could have been a child sitting behind the desk. He guessed her booted feet didn’t quite touch the floor. Bright red spots of color appeared on her fair cheeks, her complexion delicate as a porcelain doll. But the steel beneath that refined surface showed in her ramrod straight spine. Sitting beside the lawyer, Matt Black decided she was deliberately ignoring him by failing to ask why he had to be present at the reading of her father’s will. Though they’d met before, the circumstances were certainly less amiable this time. “He was…until he showed a little bit too much personal interest in you,” Mr. Simpson said uncomfortably. Matt had found her in the barn, dressed as she was now in buckskin pants and a man’s shirt. More specifically, he’d found her in the clutching embrace of her foreman, apparently not struggling to get away. He wondered why a gently born and raised woman would allow a man such liberties. Laura’s father had been a life-long friend of Paul Hill, Matt’s uncle. Hill, being too ill himself to perform the duties for his friend upon his recent demise, had relegated the job to his nephew. Matt owed much of his success in life as both a railroad and lumber baron to his uncle, so he’d willingly agreed to attend to Miss Woodbury’s future while on business in Montana. Matt sighed. The man may have been an adequate foreman, but he had no business putting his hands on her. Which was exactly what Matt told him when he tossed the no-good off the ranch. She turned an ice-blue gaze on Matt, one he guessed likely silenced most men … not him. His father had passed away when he was but sixteen, leaving him with four younger sisters and his mother to care for. He’d become the ‘man’ of the house then and, quite frankly, his gentle mother couldn’t handle her brood of strong-willed daughters. Soon, he found himself in the unenviable position of being guardian and disciplinarian. A week didn’t go by when one of his sisters was planted over his knee for a plain old-fashioned whipping. Initially, he’d hated the chore, but eventually fell naturally into the dominant role, and in due time, the girls listened to him, and the discipline sessions grew farther apart. Now, as they were all married, they were their husbands’ responsibility, thank God. Looking at the cool exterior of Laura Woodbury, he decided she was no different than his sisters and suspected sooner than later she’d be over his knee. He smiled at the thought, thinking how different this would be from spanking his sisters, but he was the man for the job, and would exert his authority over her. Sinking back against the back of his chair he found himself delighting in the prospect. Matt had to wonder about the uncertainty crossing her face. She appeared to not believe a single word he said. Her uncertain expression changed to sadness, and he tried recalling what he’d said to make her so melancholy. Recalling his words about how much her father had wanted her cared for must be the reason. “Settled, Miss Woodbury, as in married.” With her long, gold hair and pretty features, Matt had the feeling finding a suitable man to marry her wouldn’t be difficult. She gasped, then started coughing behind her hand, her eyes filling with tears. “Are you all right?” Matt asked as he went to stand but settled back in his chair at her upraised palm.